Perhaps one of the most recognisable paintings of 19th century France, Gustave Caillebote’s ‘Paris Street; Rainy Day’ is an intriguing view of a less optimistic side of Paris often expressed in the paintings of the Impressionists. It does not take long to realise that Caillebotte’s work is not typical of the overall Impressionist style. The looseness of brushwork is replaced with smaller, more delicate work that seems to have more in common with Seurat’s Neo-Impressionism, and the emphasis on the speed and energy of the city is in turn substituted for an almost unsettling stillness. This word, ‘unsettling’ is appropriate to the piece: Caillebotte expresses the increasing social unease caused by the fast ‘Haussmannisation’ of Paris, which took place over his lifetime, and which resulted in a sense of social isolation and class divide. Caillebotte was independently wealthy – he did not rely on painting for his income. He played an important part in the Impressionist movement, partly because he was able to buy the works of his friends, particularly Monet and Renoir, thus sustaining them at times when they were financially unstable. Although his style seems so different to these painters, he does in fact abide by many of the common characteristics of the Impressionist painters. His interest in the representation and nature of light can be seen most clearly in the shadows, and the stones of the street itself. Shadows are not black, as the Impressionists felt this created a dullness and flatness of space. The stones are made up of several different colours, which unify to create the grey we see, again with the aim of representing the scene as it would have been seen by an observer, an attempt to gain greater realism. It is oft forgotten that the Impressionist movement was strictly a move towards greater realism, as painters tried to paint what they saw, rather than simple what was there. Caillebotte’s use of colour is also typical, he makes heavy use of different shades of yellow and blue. This was common among the Impressionists as it was in this period that chemical pigments were being produced, with bright blues and yellows proving particularly effective (and far cheaper than their organic equivalents). Alongside this was the development of lead tubes and lighter, more portable easels, all of which enabled the ‘en plein air’ technique for which the Impressionists became so famous (although, on a side note, the Pre-Raphaelite Brotherhood, over 20 years earlier, had done much of their work outdoors, and even earlier Constable had become famous for his six-foot sketch canvases, which he completed in the open air, and then worked up in his studio). But it is in the tone of the painting that we see Caillebotte most clearly as an Impressionist. ‘Haussmannisation’ was the remodelling of Paris undertaken by the so-called Baron Haussmann (he was not a real Baron, simple named himself as one), under the leadership of Napoleon III. It aimed to clear the city, modernise it, making it’s spaces more useful for the increased use of carriages, and for the capitalism which was beginning to develop, with the rise of large department stores and ready-made clothing (evoked brilliantly in Emile Zola’s ‘The Ladies’ Delight). From a more pragmatic point of view, the new cities wide boulevards were also intended to prevent further revolution: the streets of the medieval city were narrow, and easily blockaded, whereas the very wide new streets would require far greater resources, organisation, and man-power to block, whilst also allowing easier movement of government troops. So Haussmannisation rid the city of the cramped medieval houses which inhabit the pages of Victor Hugo’s ‘Les Miserables’ and transforming it to the city of open boulevards and tall houses we see today. This design created a new lightness in the city, which can be seen particularly Renoir’s cityscapes (Renoir was a Parisian, and thus perhaps most aware of the stark changes). But it also lead to a new social segregation, as the working classes moved out into the growing suburbs, while the new bourgeoisies lived in the city houses, with only their servants. Previously houses would have been split between families of different status and wealth, with poorer families often inhabiting the garret or basements of houses owned by wealthier citizens. Altogether these factors, although creating the iconic city we know and love today, had almost strong social effects at the time, resulting in a new sense of isolation. The city was bigger, the people emotionally further apart, and the mood captured by many of the Impressionists particularly – Monet’s ‘Plum Brandy’, Degas’ ‘L’Absinthe’ – is the loneliness of the crowd. It is this which Caillebotte taps into in ‘Paris Street; Rainy Day’. Throughout the composition Caillebotte has arranged elements in order to emphasise social unease. 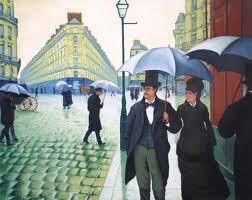 The area depicted is an intersection near the Gare St Lazare, in a wealthy district near Caillebotte’s own home. Contrary to the depiction, it is not a particularly large space. Caillebotte has exaggerated its size almost as a metaphor for the increasing social and emotional distance between the people. This helps to strengthen the idea in the viewer’s mind that it is the new city which has created this effect. This is also suggested by the scaffolding at the end of the street, which leads into the depth of the painting. The scaffolding suggests that the city is continuing to change, and implies that these problems will not easily go away. It is also important to bear in mind when viewing this painting that any awkwardness we feel would have been far worse for its original audience. It was exhibited in the Third Impressionist Exhibition (which Caillebotte made a large contribution to the funding of), and the people attending would have been people living in Paris, who had witnessed these conditions all around them. Having it spelt out so clearly must have made them somewhat self-conscious, particularly as they were largely the bourgeois middle classes. The eye-lines of the figures do not meet, even the couple look away from each other: there is no sense of human connection. Each of the figures seems lost, or trapped, in their own world. Caillebotte seems to have captured a particular moment of impending social embarrassment: as they walk along the pavement, the figures are oblivious to one another, but they are about to be brought sharply back to awareness, as if they proceed, their umbrellas will surely clash. There is thus a sense of urgency and mild horror as we realise what is about to happen, where having captured the moment before allows the viewer all the quick thoughts and embarrassed realisation that precludes these minor, but off-putting events. The painting as a whole is also imbued with a sense of awkwardness by Caillebotte’s positioning of perspective. He shows his awareness of tradition through his deliberate breaking of the Golden Section. This is achieved by placing the lamp-post directly in the centre of the painting. This splits the painting evenly, leaving the viewer with an uncertainty as to how to view it, rather than the easy path through the paintings provided by the thirds of the Golden Section. Awareness of Renaissance tradition is seen also in the way he models objects with light. We can see some similarities, through this and the stillness of his figures, between Caillebotte and Piero della Francesca. This can be seen particularly through comparison of the modelling of Caillebotte’s umbrella, and the octagonal fountainheads of the Ideal City, by the school of Piero della Francesca. Now hung in the Art Institute of Chicago (Impressionist works proved highly popular with American patrons, within the lifetime of the artists), it is thus easy to see why ‘Paris Street; rainy Day’ has been called one of the most effective paintings of the modern urban landscape of 19th century Paris. Caillebotte has used all his delicacy and subtly, combined with the social elegance of one accustomed to really seeing, and taking real thought for the people around him, to create a stunning depiction of human non-interaction, and which brilliantly captures the mood of its time. It’s popularity is ensured by the fact that it is hard not to like some aspect, and though its message may be uncomfortable, it is one that has perhaps become even more relevant in the centuries since it was painted. From 6 Oct 2012 through 8 Jan 2012 in Québec City, the family has assisted in bringing the “Caillebotte Brothers Private World” Expo from Paris. It includes 50 of Gustave’s paintings along with 150 private family photos by Martial. We hope you can attend. – American cousin of Gustave & Martial.